Any trip to Israel isn't complete without a visit to Yad Vashem, the country's official memorial to the victims of the Holocaust in Jerusalem. But since I visited it a little over a year ago and cried my way through exhibit after exhibit, this time I wanted to explore other sections of the complex. Since I gravitate to expressions of creativity when I'm traveling, I spent my entire visit at the center's two art museums. 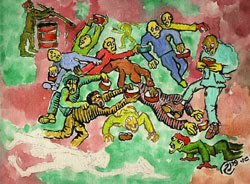 These present the Holocaust in a whole new light, emphasizing the creativity of survivors as well as those who painted, drew or sculpted while in hiding or who were living in the ghettos and who ultimately didn't survive. "Virtues of Memories: Six Decades of Holocaust Survivor Art" is a temporary exhibit with 300 works by an equal number of survivors who created their art after the war. Some later became professional artists while many others relied on art as a means to express an oftentimes indescribable experience. The images are divided into sections based on theme (for example, fires, the exodus, deportation, the camps, prison scenes, women and children) and visual presentation (such as black and white scenes done with pen and ink, linoleum or graphite; sculptural works; and abstract art). The exhibit is fascinating because of the myriad ways -- whether through symbol, a vivid palette or the artistic style -- each artist remembers his or her cruel experience. 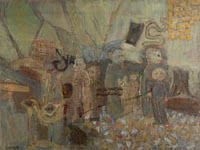 One painting displays chimneys spewing billowing clouds with the letter "J' inserted in each. A sculpture of an outstretched striped prison shirt is constructed of mixed media. An aluminum tree grows leaves of hands reaching for the sky, while a bold abstract piece appears to depict a web of wires amid splashes of chaotic color. I spent an hour taking in not only the multitude pieces but also the memorable quotes inscribed on the walls, such as this one: "I remember just one thing: the clatter of the wheels." Then I meandered to the adjacent Holocaust Art Museum with its permanent collection of works done during the Holocaust. Here I was surprised at the many sun-filled landscapes or brightly painted pieces that had absolutely nothing to do with the many brutal acts of the tragedy itself. Even more surprising is how these dedicated artists who were physically lacking much that we take for granted and who were mentally stressed to the limits of the human capacity were able to create vibrant works while fashioning art supplies out of the bare basic materials at hand. It was fascinating to linger over the works and read the mini biographies of the artists which describe where they studied, painted, whether the Nazis discovered them and their ultimate fate. I found a section dedicated to Carol Deutsch who painted striking gauche illustrations of the Bible. (Twenty-five of the 99 he created for his daughter are on display.) Though he was murdered in the camp, his daughter ultimately found his oeuvre in a large wooden box elaborately adorned with a menorah and a Star of David. The wealth of works that young Charlotte Salomon painted while hiding in France is outstanding, including her delicate watercolors that portray images of the villa where she and her family took refuge, the colorful blooming gardens, and the surrounding leafy forest. Despite being ordered to paint S.S. officer Felix Landau's nursery with fairy tale images, artist and writer Bruno Schulz managed to inject his own style and personality into the works. On display are the remains of the fanciful frescoes all painted under coercion. Schultz's father is the bearded dwarf in the Snow White imagery. The carriage rider representing a scene from Cinderella is Schultz himself. In fact, the carriage and driver motif appear frequently in his works. 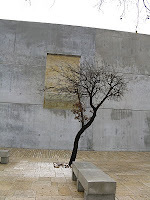 Even more interesting are the trees that may have been meant to represent Bronica Forest where Landau executed Jews. 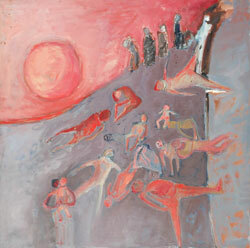 Despite the brutality of the Holocaust, creativity somehow manages to continue unabated. And, though these artists may have not all survived, they were able to leave their legacy which provide a window into their state of mind and their reality so that we may never forget. I've been to Israel many times and have been to Yad Vashem years ago. 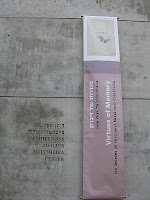 However, after reading about your visit it's time for another visit to Yad Vashem to see the art work myself. 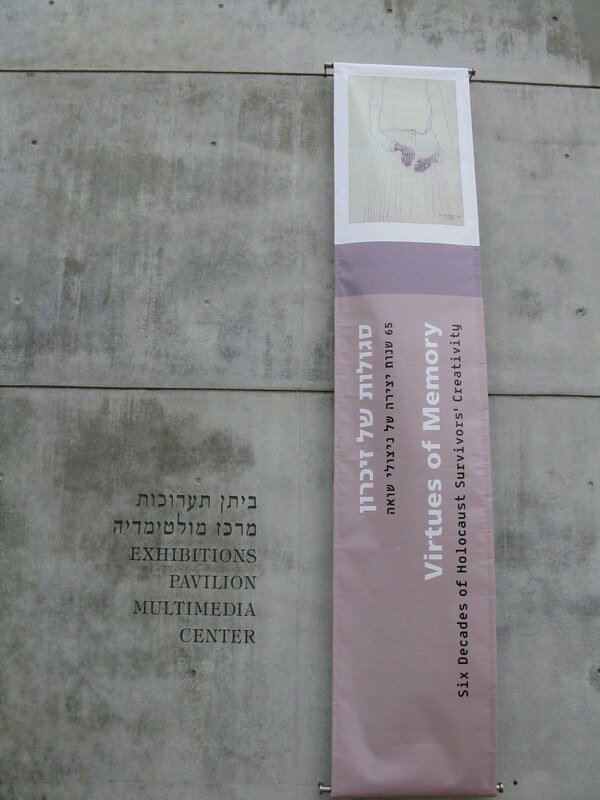 Hi, I've met several people who have also told me that they had visited Yad Vashem but never saw the art museums. Definitely worth a second visit. I had no idea there would be an art section to the museum. Those are some powerful images. Wow. What an incredible exhibit. I have to say I would be hesitant to go there because the sadness would be overpowering for me, but this artwork would make it something I would want to see. Amazing artwork, J. Thanks for posting. Hi Jane, Glad you enjoyed this post. I was quite surprised by the extensive and powerful artwork and images on display here. Hi Roxanne, I was surprised too. The last time I was there, no one mentioned the art galleries. And I was the only visitor in these galleries this time as well. 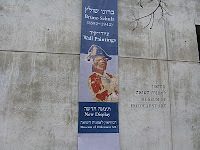 Hi NoPotCooking, Yes, Yad Vashem evokes such sadness. But it's such a testament to the human spirit that these people were able to create these works. Amazing that creativity like this endured during such horrific times...but it's always been so...art triumphs above evil. Thanks for sharing. Hi sarah, Yes, I was simply mesmerized by the myriad works. That's why I spent close to two hours exploring these galleries. I wonder if these were established after 1990 when I was at Yad Vashem? So glad you posted this and showed so many of the images. Really, I'd just like to start following you around (physically, not just by blog) and seeing all the great things you find. Gorgeous artwork. Thanks for the introduction! I didn't realize there was such an extensive artwork collection there either. What a tragic subject but an important one not to ever forget. 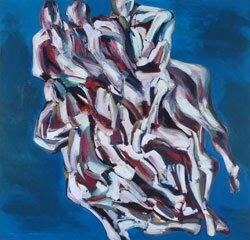 I've noticed that sometimes when dealing with subjects as enormous and hard to accept as the Holocaust, art can reveal emotions and experiences that would overwhelm us if presented in other ways. These images are both beautiful and horrifying, in ways that only art can be. Thanks for sharing. Hi Vera, I'm not sure when the art galleries were established at Yad Vashem. I'm glad you enjoyed the post. 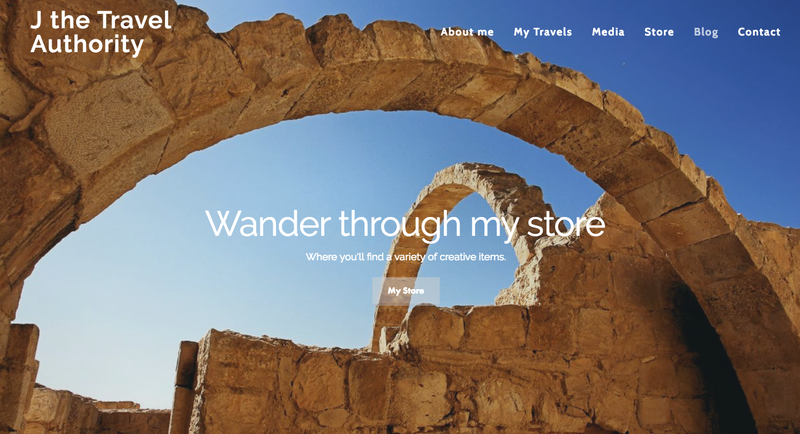 I'm honored that you'd like to travel with me when I'm hunting for hidden treasures. I read your posts, like your recent one on Tucson, and see that you seek out plenty of treasures as well. Hi Stephanie, Glad you enjoyed the images of the paintings I chose. Such varied styles and so much energy. Hi Kristen, Yad Vashem has a huge collection of Holocaust art that they rotate through the galleries. I'd like to return in a year or so to check these out as well. Hi Melanie, That is such a good point, how art can be used to express the unexpressable. Haunting and beautiful at the same time. I have visited other Holocaust museums and the experience has always been so difficult and wrought with huge emotion. But I suppose seeing the creativity that came out of such horrific experiences would be fascinating. Hi Sheryl, I've visited many Holocaust museums as well but this is the first where I saw such an extensive array of artwork. Great pieces of art! Thanks for sharing! I've seen some examples of Holocaust art, and also art which has come out of painful times in the US Civil Rights era and the Hispanic communities along the US Mexico border. the sadness and the hope in such situations both find expression. Hi Steve, Thanks for commenting and I'm glad you enjoyed the art I posted. Hi kerry, You've brought up a good point of the many tragic events that have nonetheless inspired some breathtaking art. I recently visited Civil Rights sights for an article of mine and also was overwhelmed by the art from the many victims. 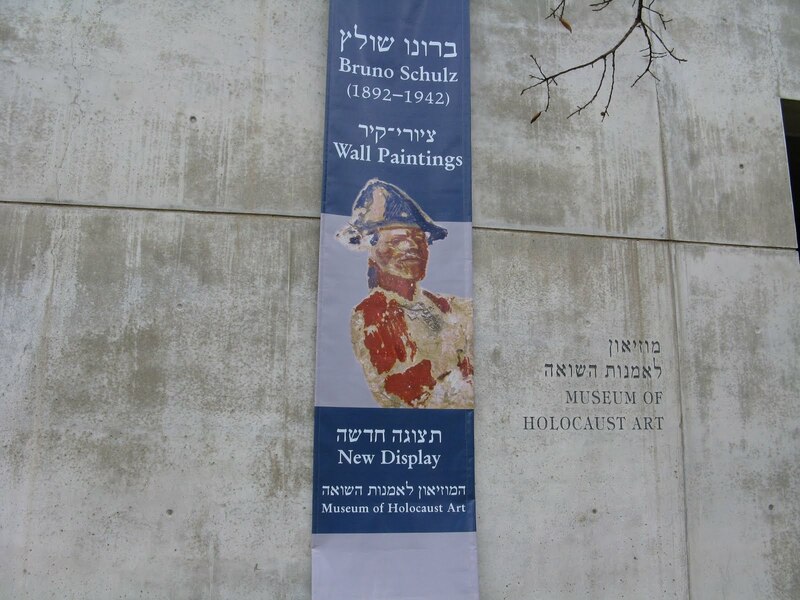 Depending on what is meant by "holocaust survivor", I was surprised to see painter Erwin Wending included in this "category"
as both he and my parents and I came to the US about the same time. Seeing the writing on the wall in Europe, and at the insistence and with the legal and financial assistance of my paternal grandfather,who had emigrated to the US many years before,we arrived in NYC on the Dutch (still neutral at that point) ship SS Staatendam, in 1939. My family and I met Wending in NYC in the 50's ??? He was a friend of my parents and came to the house regularly. He made a charcoal sketch of my mother,head only, which I found excellent. still life, that he gave me as a 'thank you' note after a dinner party I invited him to, when I was a newlywed. hypersensitive individual,who spoke of the great kindness he encountered among the English people after he escaped Germany,to England. Over the years, he gave me three of his works,which I still have. The largish, still life in jewel tones, with much black outlining of objects, a la Braque; the charcoal study of my mother Lucy,an exceptionally beauful woman,(I think he had an unrequited crush on her! )and a small,abstract beach scene. Mother and I spoke of him from time to time, wondering how he and his muse were faring and always intended to get in touch,but never did. Triste ! He was a hypersensitive,lonely, sad man and I have often felt badly, that I did not make a greater effort to maintain our friendship, but life and location got in the way...(in my not very valid defense;two marriages and four children ! I rather associate him with Van Gogh in my mind - although the styles are quite dissimilar. I would be so happy to see that Erwin finally got some recognition. He was not a boundary breaking genius, but he did devote his entire life to his muse and he continued to evolve !